Space Availability as of April 1, 2019: We are currently sold-out of exhibitor space for the 2019 Lake Havasu Boat Show. If you are still interested in exhibiting, please email info@lakehavasuboatshow.com and you will be added to the "wait list" should a cancellation occur between now and April 4. Thank you. Standard Space Rates Now in Effect as of January 19, 2019. 2019 -- BOATS and PWCs IN-WATER FOR DEMOS: DOCK SPACE IS LIMITED. SIGN-UP EARLY TO RESERVE YOUR SPOT -- ONLY $12.OO PER LINEAR FOOT (length). For exhibitors with boats in-water at the demo dock, or with boats on trailers in the "get-ready" area of the launch ramp, we will be providing complimentary golf car shuttle service between the main exhibit parking lot area and the launch ramp. BE ADVISED - THERE WILL BE A $100 CHARGE PER BOAT/TRAILER PARKED IN THE "GET READY" AREA OF THE WINDSOR 3 LAUNCH RAMP. In order to expedite prospective buyers from your on-land display area and the launch ramp, we will provide you with the cell numbers of the shuttle drivers. When you have a prospect wanting to take a demo ride, simply call the shuttle driver and they will come to your display space to pick-up your prospect and take them directly to the demo dock. ALL SPACES MUST BE PAID IN FULL NO LATER THAN MONDAY, MARCH 4, 2019. In order to receive a refund on a pre-paid deposit, a notification of cancellation must be received in writing or by email by March 4. Sorry, no exceptions. You do not have to have a PayPal account to pay online, all major credit cards accepted. Select the check-out as a guest option. SPACE APPLICATIONS MAY ALSO BE MAILED, EMAILED OR FAXed. Boat Show management reserves the right to make final determination of space assignments in order to best utilize available space and to enhance the overall appearance and conformity of the Boat Show. Space applications with deposits received after January 18, 2019 will be assigned space on a first-come, as available basis (previous seniority consideration will be void) and Standard Space Rates will apply. No space refunds after March 4, 2019. Sorry, no exceptions. Please be advised, this is a RAIN or SHINE event -- the boat show will remain open as long as weather is not deemed dangerous to show visitors or exhibitors. Extreme wind, rain, and/or lightning could require temporary show closure. Show management reserves the exclusive right to determine if weather conditions dictate closure to the public. EXHIBITOR NOTICE: If you have submitted a space application without a deposit, please be advised that we cannot assign you a space until a deposit has been received. If you would like to become a member of the Lake Havasu Marine Association, please log-on to www.lhmarineassn.com or call (928) 208-2442. HOST HOTEL: Hampton Inn, 245 London Bridge Road, Lake Havasu City, AZ 86403, (easy walking distance to the Boat Show) 928-855-4071. Ask for special Boat Show rate. ALL EXHIBITORS/VENDORS – PLEASE READ -- TEMPORARY BUSINESS LICENSE INFO! 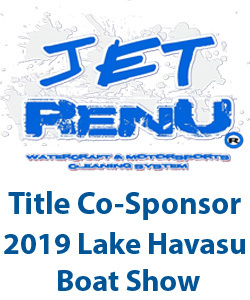 2019 LAKE HAVASU BOAT SHOW EXHIBITOR MOVE-IN INSTRUCTIONS – PLEASE READ! LOCATION: Boat Show exhibitor staging entrance is at the far southeast double gate entrance to Windsor 4 (see directions below). Show Coordinator Debi Miller will be stationed at that entrance to direct you to your assigned space/booth. Please do not enter the display show area until you have spoken to her. (Directions to staging area: the southeast double gate entrance to Windsor 4 is located directly behind the Bridgewater Motel at 101 London Bridge Road. To get there from Highway 95, turn to the west off Highway 95 on to London Bridge Road, In N Out Burger is on the corner. Proceed west on London Bridge Road for approximately 1/3 mile and take the small road/alley access to your left just before the Bridgewater Motel. This road/alley access takes you directly to the double gate entrance to Windsor 4). MOVE-OUT SCHEDULE: Sunday, April 7, 2019 (3pm to 6pm) -- Monday, April 8, 2019 (7:30am to noon) -- all exhibitors must be clear of Windsor 4 as of noon on Monday. -- The Boat Show Office will be located at the far southeast corner of the upper asphalt parking lot at Windsor 4. The Boat Show office will be open on Thursday from 1:30pm to 5:00pm, Friday from 8:00am to 6:00pm, Saturday from 8:00am to 6:00pm and Sunday from 8:00am to 3:00pm. -- All exhibitors must check in upon arrival at the Boat Show Office to pick-up their Boat Show packets, exhibitor identification and sign receipt of boat show rules and policies. Any remaining unpaid balances for spaces or booths must be paid at that time before move-in. LOOKING TO RENT A BOOTH OR EQUIPMENT? Contact Curtiss Erickson at COOL RIVER PARTY RENTALS, Lake Havasu City based, serving all of Mohave County, call 928-412-2231 or 805-216-0447 -- email curtisserickson@yahoo.com. Standard Booth Package: EZ-Up shade, (1) 8′ table and (2) chairs only $75.00 including delivery and pick-up plus tax. Additional tables $8 each, additional chairs $1 each, chill tubs $4 each and mister system $50. Generators, tenting, linens, lighting, etc. also available. All exhibitors are responsible for bringing their own display equipment (EZ-Ups, chairs, tables, etc.). -- Forklift assistance will be available to position boats as needed and for off-loading heavy cargo. Exhibitors are responsible for taking their own boats off trailers if so desired. -- All spaces and booths must be staffed during all show hours: Friday noon to 6pm, Saturday 9am to 6pm and Sunday 9am to 3pm. -- NO OUTSIDE ALCOHOLIC BEVERAGES OR GLASS CONTAINERS ARE ALLOWED AT THE BOAT SHOW, BY EXHIBITORS OR GUESTS. COOLERS BROUGHT INTO THE SHOW GROUNDS MAY BE SUBJECT TO INSPECTION. There is very limited electrical power on-site. Portable generators are permitted only with permission of show management and conforming to local fire department standards. Portable generators must be equipped in order to avoid CO contamination to show guests and other exhibitors. -- There is no parking of vehicles inside the Boat Show which are not part of the display. Vehicles may temporarily load or unload and then park in the appropriate adjacent parking lot on-site. Please keep aisle ways clear so move-in and move-out may proceed smoothly. Unattended vehicles parked inside the Boat Show are subject to tow-away at the discretion of Show Management. -- All exhibitors are urged to exercise care and caution when leaving displays/merchandise unattended (overnight). Unexpected changes in weather may occur suddenly. It is strongly recommended that free standing tents, E-Z Ups and other coverings be lowered, taken down or secured with heavy weights. Sorry, no spikes or stakes allowed in the asphalt parking lot area to secure tents -- by order of the Park Service. Boat Show management is not responsible for weather/wind related damage. IMPORTANT CONTACT INFORMATION: Starting Wednesday, April 3, 2019 please use the following phone numbers to contact Boat Show management. The On-Site Demo Dock will be open during all regular boat show hours. There is a fee to have a boat at the Demo Dock. Please reserve in advance, dock space is limited. Move-in: Wednesday, April 3, 2:00pm to 6pm; Thursday, April 4, 8:00am to dusk and Friday, April 5, 7:30am to 11:30am. Move-out: Sunday, April 7 after 3:00pm, Monday, April 8 from 7:30am to noon, all exhibit material must be removed by noon, April 8. Security will be present from Wednesday, April 3, 6pm through Monday, April 8, at noon. All bulk space exhibits and booths must be attended/manned during all show hours. There is no electrical power on-site. Portable generators are permitted only with permission of show management and conforming to local fire department standards. Exhaust emissions from generators must not cause a health to other exhibitors or show guests. Bulk exhibitors and booth vendors are responsible for their own move-in and move-out. Boat Show management does not offer storage. Aisle-ways and fire lanes must be maintained and clear. Exhibitors may not use general aisle space to promote their products or conduct sales. Boat Show staff will have forklifts on-site to assist with heavy loading and unloading of display items and moving boats/trailers into final position. Boat Show staff will not be available to off-load exhibitor boats from their trailers. If an exhibitor wishes to display boats off trailers, they are responsible for that activity. Private crane rental services are available in the immediate area to provide that service. All exhibitors are required to abide by all local regulations pertaining to licenses and permits. In addition, all exhibitors must have minimum general business liability insurance coverage of $1,000,000. Any accident or injury occurring within the assigned bulk or booth space is solely the responsibility of the exhibitor. NO OUTSIDE ALCOHOLIC BEVERAGES OR GLASS CONTAINERS ARE ALLOWED AT THE BOAT SHOW, BY EXHIBITORS OR GUESTS. COOLERS BROUGHT INTO THE SHOW GROUNDS MAY BE SUBJECT TO INSPECTION. Food, beverage and beer will be available for sale on-site during regular show hours. All exhibitors are urged to exercise care and caution when leaving displays/merchandise unattended (overnight). Unexpected changes in weather may occur suddenly. It is strongly recommended that free standing tents, E-Z Ups and other coverings be taken down or secured with heavy weights. Boat Show management is not responsible for weather/wind related damage. All exhibitors must wear official boat show identification issued by show management during show hours. Identification may be picked up at the on-site boat show office starting Thursday, April 4 at 1PM. Booth spaces are allowed up to 6 free exhibitor ID badges. Bulk spaces are allowed up to 8 free exhibitor ID badges. Additional identification is available for $3.00 each. Extra identification will be issued on site at the boat show office if needed. Identification will only be issued to registered boat show exhibitors and media/press. Boat manufacturers (selling manufacturer direct without a retail dealer network) may only display “for sale” boats (new or previously owned) they manufacture. No other make or brand of boat is allowed to be displayed “for sale” unless that boat manufacturer also has an existing “dealer” agreement in place to represent another brand/line of boats. If the boat manufacturer does not have a Lake Havasu City place of business, it may not display “for sale” a foreign brand of boat if it is already being exhibited by a Lake Havasu City marine dealer. All sales at the boat show must be through the manufacturer (state of origin and local regulations pertain), and a valid Lake Havasu City business license must be in force. If a manufacturer does not have an Arizona DMV RV/trailer license, the RV or trailer must be plainly marked, “For Display Purposes Only.” ). It is imperative that a manufacturer list all products it intends to offer for sale or display at the Boat Show on the original space application. Products not listed by brand and model on the space application may be denied display/for sale privileges at the Boat Show. Show management reserves the right to deny exhibiting privileges to any manufacturer (Lake Havasu City based or not) who in the judgment of show management is conducting itself in a manner that presents unfair competition to others in the show. 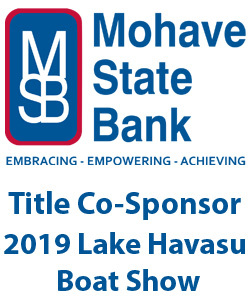 Lake Havasu City marine dealers will be given first opportunity to exhibit (commitment deadline is January 18, 2019). Requests for exhibit space from dealers located outside of Lake Havasu City will not be granted until such time that the application has been reviewed and voted upon by the Lake Havasu Marine Association Board of Directors who will decide whether the admittance of that dealer does, or does not, constitute a conflict of interest and potentially unfair competition to local dealerships. There shall be no duplicate brands of new boats displayed “for sale” at the boat show by separate dealers. An exhibitor may, however, display boats of a duplicate brand “not for sale” in order to show specific products and services (engines, drives, accessories, rigging, installation, etc.) it offers to the public “for sale.” Dealers may display new and/or used boats “for sale”. In order to be eligible to participate in the Boat Show, dealers must have the following documentation in place: A) an Arizona DOT license for trailer sales. B) An Arizona G&F dealer license. C) A Lake Havasu City business license. D) Sales tax license from the State of Arizona. E) Documentation indicating that the dealer has exclusive distribution/sales rights to their boat brands to be displayed at the boat show in the Lake Havasu area (dealer of record). F) Documentation from the motor manufacturer(s) that are installed or accompanying the boat models offered indicating a service agreement to sell or "rig" and service said motors. G) Dealers mush have a physical place of business, not a Post Office Box. Normally space applications are reviewed at regularly scheduled monthly LHMA Board of Directors meetings. Urgent issues can sometimes be accommodated on a special 5-day notice. If a dealer does not have a valid Arizona DMV RV/trailer license, the RV or trailer must be plainly marked, “For Display Purposes Only." It is imperative that a dealer/retailer list all products by brand and model it intends to offer for sale or display at the Boat Show on the original space application. Products not listed on the space application may be denied display/for sale privileges at the Boat Show. Show management and/or the Lake Havasu Marine Association reserves the right to deny exhibiting privileges to any dealer (Lake Havasu City based or not) who in the judgment of show management and/or the LHMA is conducting itself in a manner that presents unfair competition to others in the show. Vendors/booth exhibitors selling name brand merchandise must have a distributor agreement in place with the manufacturer of that product. There shall be no duplicate name brand products “for sale” at the boat show by separate dealers. All sales at the boat show must be through the vendor/booth exhibitor, and a valid Lake Havasu City business license, annual or temporary, must be in force. ). It is imperative that a booth/vendor list all products it intends to offer for sale or display at the Boat Show on the original space application. Products not listed by brand/model on the space application may be denied display/for sale privileges at the Boat Show. Show management reserves the right to deny exhibiting privileges to any vendor/booth exhibitor (Lake Havasu City based or not) who in the judgment of show management is conducting itself in a manner that presents unfair competition to others in the show. NOISE LEVELS -- Please keep sound at a level that allows neighboring exhibits to be able to conduct business. We will ask you to turn down or turn off any sound system/amplifier that is bothering your neighbors. Failure to do so will result in loss of power from your exhibit. Noise makers (air horns, bull horns, sirens, etc) are not permitted. SECURITY -- Show management is responsible for providing security coverage beginning at the official, published move-in time and ending at the official, published move-out time. Exhibitors are responsible for security of their booth and any loss or damage to their property during official move-in hours, moveout hours and show hours, including 1 hour prior to show opening and ½ hour after show closing. The Sand-Water-RV Expo assumes no liability for any loss, damage, or injury to any property of the exhibitor or to any of its officers, agents, employees, or contractor, whenever attributed to accident, fire, or any other cause whatsoever. SECURITY TIPS -- Securing your exhibit materials and items is always a good idea. Most losses occur during move-in and move-out, and the first ½ hour after a show closes. Do not leave your booth unattended at any time! AV equipment, cash registers, and product should be placed under a table or in a box. ⊥ Cover your tables and products after move-in and after show hours by using a sheet or something similar. The sheet can be secured with bungee cords or duct tape. Do not indicate the contents on the outside of your boxes and crates. These items pass through many hands during the shipping process as well as during the show. Permanent identification on your property will reduce temptation and make the return of these items easier should they disappear. NEVER leave money, purses, wallets or laptops unattended in your booth. Take your cash, credit cards, and credit card receipts with you at the end of each day. Do not leave valuable items/ personal items in clear view or within reaching distance of other people. Once the show closes, always be sure to pack your valuables first. STAFFING -- Exhibit booths must be staffed during all published show hours. Exhibits must open promptly at the published time each day and remain open until the closing hour each day. If an exhibitor needs access to booth before/after exhibitor hours, they must obtain security clearance from show management. Please contact the Show Management at the show office or at exhibitor registration. BOOTH CHANGES -- Changes to your booth location can occur at any time from the initial assignment until show opening. Modifications to an exhibitor’s display may be made by show management at any time. All booth designs are subject to on-site Fire Marshal approval. BOOTH DESIGN GUIDELINES -- Exhibitors are not allowed to put anything above the maximum height allocated for each type of booth without show management’s approval: 15’ x 15’ has a 10’ height limit. Bulk spaces have a 12ft. height limit unless approved by show management. Each exhibitor is entitled to a reasonable sight line from the aisle regardless of exhibit size. All printed materials and samples must be distributed within your booth only. Working the aisles or approaching people outside your booth is prohibited. Exhibitors may hang graphics in their booth, but they cannot exceed the maximum height allowed. All signs must be professionally produced. Hand written signs are prohibited. Placement of signs must be approved by show management. The use of corrugated boxes, unlabeled bins, etc. to display and/or sell product or merchandise is discouraged and may not be permitted by the Fire Marshal. Unsightly storage of inventory within your booth area during show hours (cartons of product) is not permitted. All booths must accommodate and be accessible to the handicapped in compliance with the American Disabilities Act regardless of your company’s size. Please contact show management if your booth does not meet or exceeds the show guidelines. OUTDOOR CANOPIES/TENTS/E-Z UPS -- Canopies cannot exceed the maximum booth height or booth depth. They may cover your entire booth area, but the support structures cannot be wider than 3" when placed in the front 5' of your booth. Standard booth line of sight rules apply. Canopies must be fire retardant and meet all fire regulations. If 200 square feet or more is covered, additional precautions are required (Smoke detectors, Fire Exit signs, a hand held Fire Extinguisher and an approved Certificate of Flame Proofing.) Exhibitors must comply with the local fire rules and regulations when using a canopy. DEMONSTRATIONS -- While entertaining/demonstrating in booth, you must arrange booth so audience does not block aisles, overflow into nearby booths or disrupt your neighbors’ business. Normal traffic flow must be maintained at all times. FACILITY USE -- Do not attach your materials or puncture any surface that is part of the facility, including no spikes driven into the asphalt to secure an EZ-Up or tent. This means no screws, nails, tacks, tape, carpet tape, stickers, and/or decals on anything but your own property. Doing so may result in a charge to your company from the facility for repair and clean-up. FIRE & SAFETY -- All exhibitors are required to abide by the rules and regulations listed below. All materials must be flame resistant. This includes, but is not limited to, drapes, curtains, table coverings. No combustible materials should be attached to or hung from the sides or the back of the booth. Outside areas enclosed by solid walls and/or ceilings (tents, E-Z Ups, canopies) must be approved in advance by the Fire Marshal and require operational smoke detectors inside the enclosed area. They must also have an alarm, fire extinguisher or a smoke detector in or connected to the outside area. Other restrictions may apply. Fire extinguishers, fire hoses and sprinkler closets must be visible and accessible at all times even if located in your booth. Aisles and exits must be kept clear and free of obstructions. Use or storage of compressed gases, helium, flammable liquids, explosives, and other toxic or hazardous materials may be done only with a permit and approval by the Fire Marshal and Facility. Combustible rubbish should be removed from your booth daily. Open flames for any reason require show management, Fire Marshal and Facility approval. No standing on chairs, tables, rented furniture or any facility equipment for safety precautions. All carpet must be adhered to the floor by the contractor or the exhibitor. No animals allowed unless on leash or except those assisting the physically impaired. MATERIAL DISPLAYED -- Show management reserves the right to require exhibitors to remove any materials from their exhibit which is determined, at our discretion, to be inappropriate. MOTOR VEHICLES --Fuel level must not exceed ¼ tank of gas or contain more than 5 gallons, whichever is less. ⊥ Refueling and de-fueling of vehicles must be done outside the facility and appropriate safety equipment must be used. Fuel vents must be sealed to prevent the escape of volatile and flammable vapors. All batteries must be disconnected (negative battery terminal must be disconnected). Gas caps must be locked or taped shut. No ignition source may be within 20 feet of the vehicles. Keys must be kept on site in the event an emergency removal of the vehicle is required. Vehicles and exhibits cannot block exit doors or fire lanes. Operation of any internal combustion engine is prohibited without Fire Marshal approval. Vehicles are subject to random inspections by the Fire Marshal. AT NO TIME DURING THE SHOW ARE VEHICLES TO BE STARTED, DRIVEN OR MOVED. Only exhibitors with an exhibitor badge will be allowed to remove vehicles, motorcycles, ATVs, watercraft, trailers or anything with two or more wheels. If vehicles in a booth are being removed by a third party, exhibitors need to provide show management with the contact and company name of the responsible party All vehicles MUST be removed from the facility by the following Monday at noon or they will be subject to towing. MOVE-OUT -- Early move-out is prohibited, including the early removal of vehicles. A violation of this rule is likely to result in being banned from future shows. Tear down will begin at the close of the show. Early tear-down will result in forfeiting your rights to participate in future shows.